For those seeking an extremely high quality sharpening surface, the Shapton GlassStones meet the needs of even the most discerning sharpener. The Shapton GlassStone HR Series of Ceramic Waterstones is Shapton's most advanced series of stones for sharpening hard steels and modern steel alloys. They are one of the highest quality stones available at any price. Manufactured to the strictest tolerances, the Shapton GlassStone is a high quality ceramic waterstone that uses uniform ceramic abrasives to provide a consistent and fast cut. The stones are backed with glass (hence the name GlassStone) to provide an exceptionally flat base. The Shapton GlassStones measure 8 1/4" long and 2 3/4" wide x 3/8" thick (210mm x 70mm x 10.5mm). Made in Japan. Waterstones are known for fast cutting which speeds up sharpening. Shapton GlassStones are very fast cutting, yet they wear much less than traditional waterstones. By wearing slower, they will require less flattening and you will remove less abrasive material when flattening. Each stone is backed with 5 millimeters of glass which provides a firm, flat base to adhere the ceramic waterstone abrasives. In addition, the glass backing provides you with a greater utilization of the stone because you can wear it down to the very end. In any other waterstone, as they wear thin, the stone will break and cannot be used. The abrasive particles in the Shapton stones are very consistently graded for optimal performance. In some grits, the particles are within .01 micron of one another. In other words, each particle is the same size. This uniform size allows the stone to sharpen faster and create a better finish. If a stone is inconsistently graded some particles are larger (thus providing a coarser edge) while some are smaller (slowing down the sharpening process). In usage we've found Shapton Stones to be very consistent and true to the specified grits. The Shapton GlassStone measures 210mm x 70mm x 10.5mm. This is approximately 8-1/4" x 2-3/4" x 3/8". Each GlassStone is 10.5mm in total thickness with 5mm ceramic sharpening matrix and 5mm glass backing plate. This size is a good size for sharpening most tools and knives. The stone itself is not made of glass. The ceramic sharpening matrix is actually white. The glass is only on the bottom of the stone to serve as a base. The grit and micron equivalents are marked on the underside of the stone and visible through the glass side for easy identification. Unlike traditional waterstones, Shapton waterstones do not require soaking. It is literally a “splash and go” stone. Since the binder doesn't absorb water, there is no need to soak the stones. We recommend a squirt bottle to keep the surface wet. The HR Series of GlassStones is a versatile stone for most sharpening applications (for straight razors and some high carbon steel we recommend the HC series). The HR Series is ideal for many harder steels, stainless steels as well as harder steel alloys. 120 Grit - The 120 grit stone is the most coarse of the Shapton GlassStone HR series is only to be used on very dull tools and knives. The grit particles used on this stone are very large for very fast cutting. The grit particle size measures 122.5 microns. Shapton Part #50201. 220 Grit - The 220 grit stone is very coarse and is to be used on very dull tools and knives. The grit particles used on this stone are very large for very fast cutting. The grit particle size measures 66.82 microns. Shapton Part #50101. 320 Grit - The 320 grit stone is one of the coarsest grits offered in Shapton GlassStones. The 320 stone should be used on very dull tools and knives. The grit particles used on this stone are very large for fast cutting. The grit particle size measures 45.94 microns. Shapton Part #50301. 500 Grit - The 500 grit stone is a medium coarse and is to be used on dull tools and knives. This stone is favored by many fine tool and knife enthusiasts for its ability to sharpen dull edges without causing too coarse of a scratch pattern. The grit particles used on this stone are large for medium fast cutting. The grit particle size measures 29.4 microns. Shapton Part #50102. 500 Grit Double-Thick - The 500 grit double-thick stone is a medium coarse and is to be used on dull tools and knives. This stone is favored by many fine tool and knife enthusiasts for its ability to sharpen dull edges without causing too coarse of a scratch pattern. The grit particles used on this stone are large for medium fast cutting. The thickness of the abrasive material is 10mm thick, this stone is produced in the double thickness because it is often the stone that you'd use to establish a new edge (and consequently sees the most wear). The grit particle size measures 29.4 microns. Shapton Part #50106. 1000 Grit - The 1000 grit stone is a medium and is to be used to refine the edges of dull tools and knives. The grit particles used on this stone will refine coarse edges. The grit particle size measures 14.7 microns. Shapton Part #50202. 2000 Grit - The 2000 grit stone is a medium fine and is to be used to refine the edges of dull tools and knives. The grit particles used on this stone are smaller to refine the edge. The grit particle size measures 7.35 microns. Shapton Part #50302. 3000 Grit - The 3000 grit stone provides a fine edge to tools and knives. The grit particles used on this stone are very small so it should be used on edges that have been refined with coarser grits. The grit particle size for this stone measures 4.9 microns. Shapton Part #50402. 4000 Grit - The 4000 grit stone provides a very fine edge to tools and knives. The grit particles used on this stone are extremely small, so it's to be used on edges that have been refined with coarser grits. The grit particle size measures 3.68s. Shapton Part #50103. 6000 Grit - The 6000 grit stone provides a near mirror polish to tools and knives. The grit particles used on this stone are extremely small, so it's to be used on edges that have been refined with coarser grits. The grit particle size measurse 2.45 microns. Shapton Part #50503. 8000 Grit - The 8000 grit stone provides a near mirror polish to tools and knives. The grit particles used on this stone are extremely small, so it's to be used on edges that have been refined with coarser grits. The grit particle size measures 1.84 microns. Shapton Part #50203. 10,000 Grit - The 10,000 grit stone provides a nearly mirror polish to tools and knives. The grit particles used on this stone extremely small. This stone can only be used after you've created a very sharp edge with finer grits. The grit particle size measures 1.47 microns. Shapton Part #50903. 16,000 Grit - The 16,000 grit stone provides a true mirror polish to tools and knives. The grit particles used on this stone are extremely small. This stone can only be used after you've created a very sharp edge with other fine grits. This grit is finer than any other stone we carry with the exception of the 30,000 Shapton GlassStone. The grit particle size measures .92 microns. Shapton Part #50303. 30,000 Grit - The 30,000 grit stone is the finest grit we have ever carried and provides a true mirror polish to tools and knives. The grit particles used on this stone extremely small, and can only be used after you've created a very sharp edge with other fine grits. The grit particle size measures .49 microns. Shapton Part #50403. All Shapton GlassStones are made in Japan. We have been a retailer of Shapton products for many years now. We have always found these stones to be of consistently high quality. Q. Is the stone made of glass? A. The stone itself is not made of glass. The Shapton GlasStones are backed with 5mm of glass to provide a firm, flat surface for which to adhere the ceramic water stone abrasive material. Q. What grits are available in the Shapton GlassStone HR Series? A. The Shapton GlassStone HR series has a wide range of grits. The stones are available in the following grits: 120, 220, 320, 500, 1000, 2000, 3000, 4000, 6000, 8000, 10000, 16000 and 30000. Q. Do I need a flattening stone or lapping plate for my Shapton GlassStones? A. Yes, any water stone, even the Shapton GlassStones require flattening. We recommend Shapton's Diamond Glass Lapping Plate. We recommend it for 500 grit all the way up to the 30,000 grit. For the coarser stones (120, 220 and 320 grit), we recommend the DMT Dia-Flat Lapping Plate. Q. Do I need a stone holder? A. Yes, you need something to hold the stone. The glass backing will slide on your work surface. Shapton's stone holder is wonderful, but also an investment. For those seeking an economical alternative, we have a Universal Stone Holder that accommodates the Shapton GlassStones. Q. What does the "HR" stand for in the Shapton GlassStone HR Series? A. The official meaning of the Shapton HR Series is High Resistance. Although many customers refer to the stones are High Rockwell. In either case, whether you're talking about sharpening steels with a high resistance to abrasion or just measure high on the Rockwell C scale, the HR series stone is generally the right product for you. If you just ask us for the HR, the High Resistance or the High Rockwell, you will be getting the same thing. Q. What is the difference between the HR and HC series? A. The HR and HC series are very similar, but they do have some subtle differences. The visible difference is the color, the HR is white, while the HC is a light gray. In use, we recommend the HR for stainless, modern alloys as well as most high carbon steels. The more aggressive cut of the HR makes it the primary recommendation for most knives or tools. The HC series is used on many traditional high carbon steels. The HC is only available in a 4K, 6K and 8K so it tends to be used in conjunction with the HR for many situations. The HC does tend to polish high carbon steel well and if often used in sharpening straight razors, high quality Japanese beauty shears, and traditional Japanese high carbon steel knives and tools. 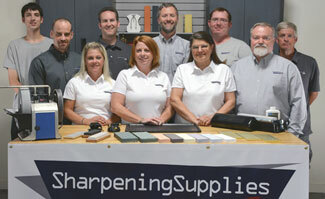 If you are sharpening a variety of knives and tools, the Shapton HR series will be more versatile.